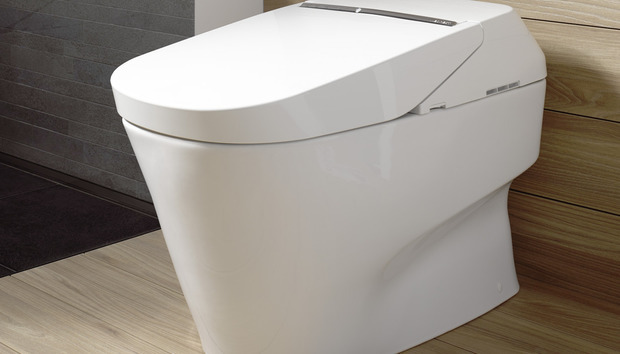 We expect to see a lot of great technology for the home at CES this year, but we’re particularly interested in stopping by Toto USA’s booth to see its latest high-tech toilet. The Neorest 750H is a bidet-like model with smart features that can detect your presence, control odor, and prevent—ahem—waste from sticking to the inside of its bowl. And the extraordinarily efficient 750H uses as little as 0.8 gallons of water per flush. Toto showed a floor-mount version of its intelligent toilet last year, with a whopping $9,800 price tag. This year, the company will show off a wall-mounted version, plus a number of other new products. With a price tag nearing 10 grand, you’d expect this toilet to do it all—and it pretty much does. There’s a dual jet system to wash you, which the company says reduces the need for toilet paper that can clog pipes. A fan will dry your bum with a warm breez. And an air-purifying system eliminates odors. The bowl itself is coated with an ultra-smooth ceramic material fortified with zirconium, which prevents waste from sticking. As you approach to take care of business, the Neorest will detect your presence and mist the bowl with electrolyzed water before and after you use it, to further prevent build-up. When the toilet’s not being used, ultraviolet lights inside the bowl activate to kill odor-causing bacteria. This toilet even has a wall-mounted control panel. Toto makes the toilet experience customizable, too, thanks to a wall-mounted remote-control panel that can store settings for two different users. You can tailor how the bidet sprays water and at what temperature, and then can decide how warm the air from the dryer should be. The seat can be heated to temperatures ranging from 82 to 97 degrees, and it will even treat you to a gentle massage. But can any toilet not fabricated from 14K gold really be worth 10 large? Well, Toto seems to have gathered a cult-like following in the U.S.. A New York Times story from last November interviewed a number of Toto’s devoted users, including one man who chose to refrain from using an airport restroom in Milan so he could use his Toto toilet at home in New York following a nine-hour flight.